This survey shows the percentage of adults in Texas who had serious mental illness in the past year from 2011 to 2015. 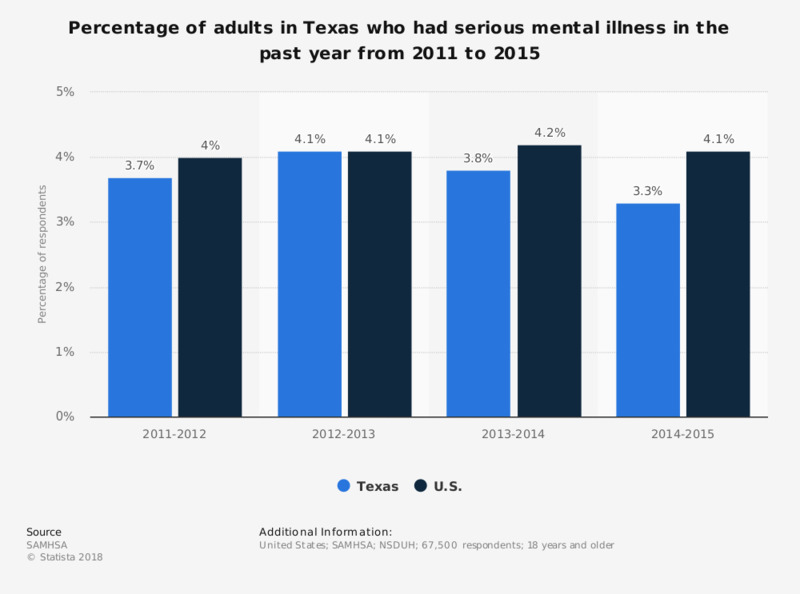 In 2014-2015 approximately 3.3 percent of adults in Texas had serious mental illness in the past year, less than the national average of 4.1 percent. State estimates are based on a small area estimation procedure in which state-level National Survey on Drug Use and Health (NSDUH) data from 2 consecutive survey years are combined with local-area county and census block group/tract-level data from the state. This model-based methodology provides more precise estimates at the state level than those based solely on the sample, particularly for states with smaller sample sizes. Estimates of serious mental illness (SMI) and any mental illness (AMI) presented in this publication may differ from estimates in other publications as a result of revisions made to the NSDUH mental illness estimation models in 2012. Other NSDUH mental health measures presented were not affected.